Vermont Secretary of State Jim Condos recently told On Point that there were three attempts to access the state’s voter database in August. “The one that raised our attention, if you want to call it [that], was the one that said ‘Russian Federation,’ and we forwarded that on to the Department of Homeland Security,” Condos said. Much of the conversation on election security has been on voting machines, which are notoriously outdated. “You probably recognize the current ones. They’re large. They kind of look like trash cans,” said Jordan Esten, the CEO of Clear Ballot. 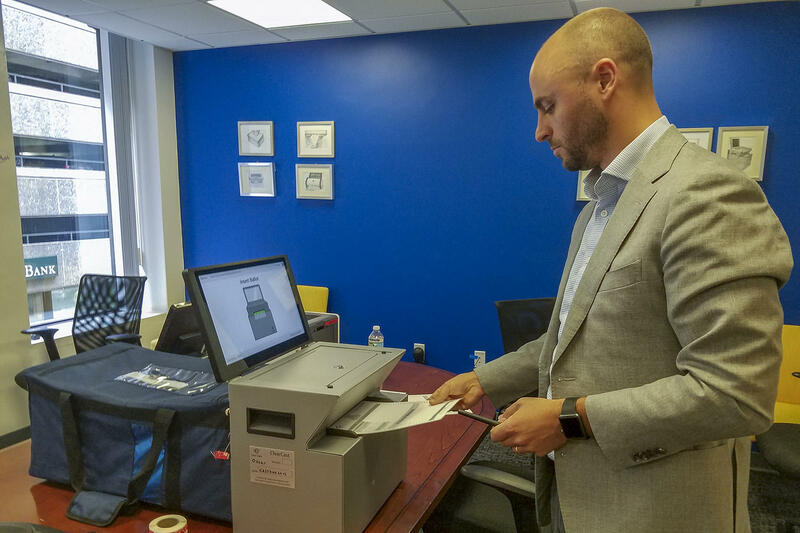 The Boston-based company has a different take on voter machines. Its design looks more like a printer with a duffel bag attached to the back that collects your paper ballot. Esten said Clear Ballot’s machines take up less storage space, which saves counties money, and are more secure because the technology can be tweaked easily. “You can continue to innovate and upgrade it as you go without sort of being stuck in technology for 10-plus years,” Esten says. Clear Ballot’s election technology includes the voting machine, and audit and support software. The system is federally certified and used in eight states including Vermont, New York and Oregon but not yet Massachusetts. The system scans images of ballots so election officials can view them digitally and double-check votes. But the company doesn’t want to go entirely digital. Esten said a paper trail is necessary. There’s another Boston company that wants to go entirely tech with a smartphone voting app. The company is Voatz. Voatz has been used in 34 small elections and in both Massachusetts state political conventions. It was also used successfully in West Virginia’s May primary. Now it will have its biggest test — West Virginia’s midterm election. Sawhney said the criticism is unfounded. The Voatz app only works with newer smartphones with advanced security features, according to Sawhney. It uses facial recognition software to verify voters’ identity and blockchain technology — a digital ledger — to store votes. There’s also a paper trail for each vote. Sawhney wants mobile voting to be an option for those who can’t get to the polls. Right now, he’s focused on deployed military and U.S. citizens abroad. But it’s not just your actual vote that can go wrong. Imagine a vigilante group hacks into traffic signals to cause gridlock. Or shuts down a bridge with a bomb threat. Or unleashes an army of Twitter bots to spread false information about the election. This was election day in “Nolandia” — a fictional mid-sized city in a swing state. Boston-based Cybereason recently held an exercise with staff, cybersecurity students and public safety officials to put the scenarios to the test. In one room, a “red team” of hackers were eager to wreak havoc. In another room, a “blue team” of law enforcement officials, including former Boston Police Commissioner Ed Davis, calmly tried to respond. Cybereason wanted to show what kind of chaos is possible during an election. The company develops tools to respond to cyber threats. But it’s up to cities and towns to react. Sean Maloney, a state trooper assigned to the FBI’s Boston office, participated in the exercise and said cities and towns need more resources. 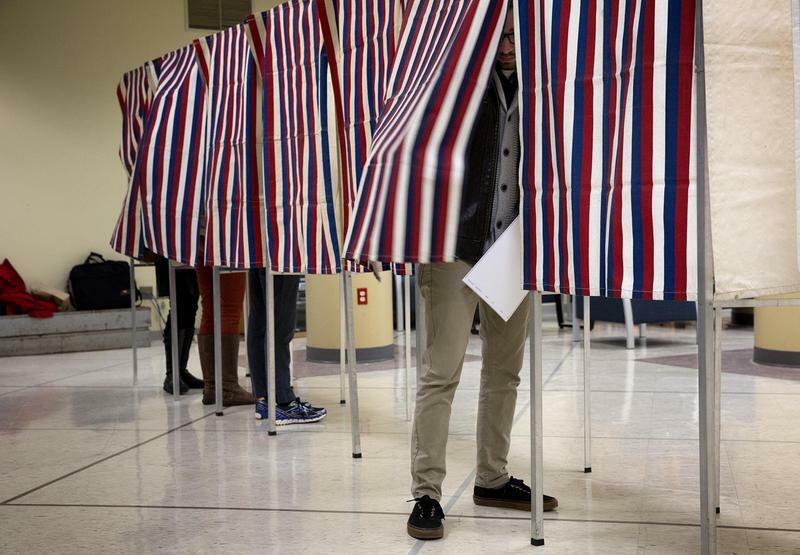 The federal government has offered $380 million in grants to states, including $7.9 million to Massachusetts, for election security upgrades. But some say it’s not nearly enough to deal with the range of attacks that could happen. Secretary of State William Galvin on Monday projected at least 2.4 million voters in Massachusetts will cast a ballot in this year’s election. Already, Galvin said 585,000 people took advantage of the state’s early voting period, which ran from Oct. 22 to Friday. Election Day is Tuesday. There are currently 4,574,967 registered voters in Massachusetts, including those considered “inactive” because they haven’t voted in recent elections. Early voting has been underway in Massachusetts for the past week. Several local officials who oversee the process in the western part of the state said they're seeing a positive response. The state of New Hampshire is indicting a couple for knowingly voting in more than one state in the 2016 presidential election. Massachusetts on Thursday became the 14th state in the country to adopt an automatic voter registration system, according to Secretary of State William Galvin and advocates who backed the measure.